Self-important pop-up ads aren’t clever and need to stop. First off, I have a few confessions to make. Despite being a business and economics writer, I’m not interested in today’s most important stocks. I don’t actually like winning. And really, I don’t care about the future, either. Sorry. These are weighty insights indeed, but I know they are true because they came to me from that source of all truth, the Internet. Or, to be more precise, from a series of small messages that I’ve clicked, thereby expressing my philosophical preferences, in order to close out of pop-up ads on the Internet. These ads typically crop up on websites to advertise a newsletter, or sometimes a product. They offer a space to enter your email and below that a big, brightly colored button to submit it. But should you not be interested, they also include a pointed, slightly guilt-inducing opt-out message in small print. I’m not interested in protecting my skin. 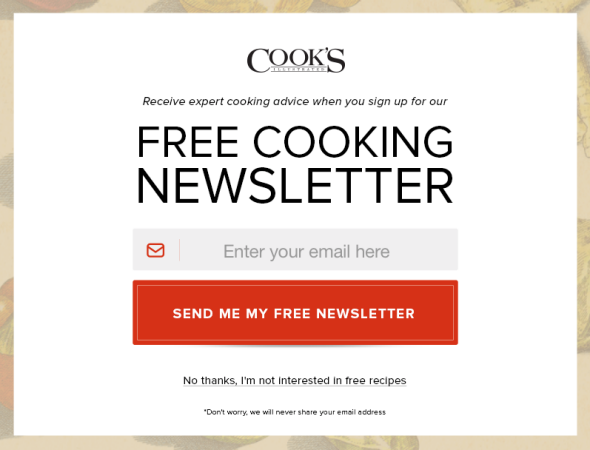 I’m not interested in free recipes. I already have a bikini body. I don’t think our generation needs a voice. More than learning about myself, I’ve also learned about how incredibly important and influential the purveyors of these ads and subscription notices are. 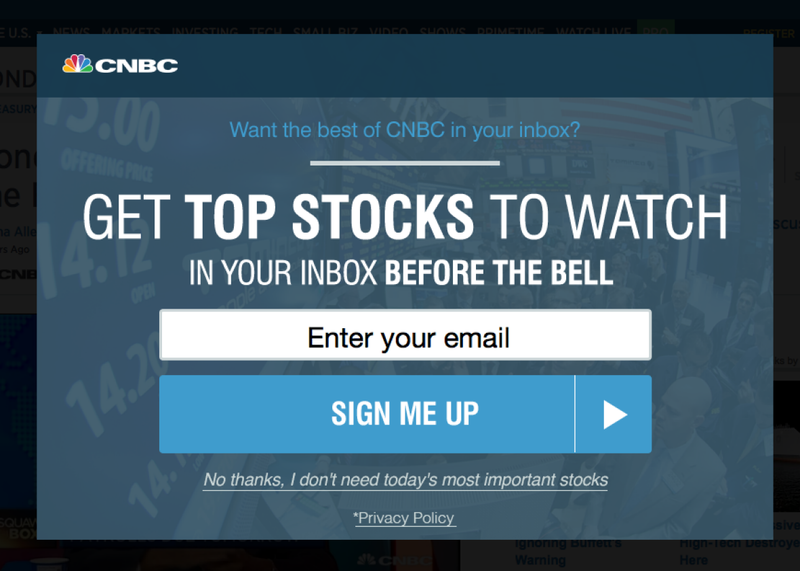 Who would have guessed that opting out of a CNBC newsletter was the same as turning down the day’s most important stocks? That passing on an iHome speaker sweepstakes meant disavowing all desire to win? That declining a manifesto on travel in 2020 was tantamount to declaring apathy about the future? If anyone knew, it was Bounce Exchange, the 3-year-old ad-tech startup behind many of these overlays. Earlier this month, Ryan Urban, the company’s co-founder and chief executive, told my colleague Heather Schwedel that opt-out messages some might find judgmental he considers “playful.” Because nothing says playful quite like accusing your readers of not caring about themselves or their generation. Other adjectives he might want to consider: aggravating. Obnoxious. Pompous. On its website, Bounce Exchange claims that its technology has “unlocked ‘exit-intent,’ ” aka the ability to “accurately predict on any device when a visitor was going to leave before they actually left.” From personal experience, I’d say this is a fair claim. In fact, this style of pop-up has unlocked my exit intent for plenty of websites, so much that I’ve vowed to never return to them ever again. Good job, guys! These pop-ups are so irksome because they fail at everything they try to accomplish. They present themselves as witty and playful, when they are really only annoying. They set up choices that feign an understanding of readers’ thoughts and values, but actually are premised on totally absurd comparisons. Most maddening, though, these pop-ups are invariably phrased to be about you when in reality they are utterly self-absorbed. How else could anyone possibly equate disinterest in a Men’s Health newsletter with “not looking to lose weight?” Or turning down a random travel manifesto with not caring about the future? Well, in the interest of the future—even though I don’t care about that—here’s some free advice for whomever is writing the copy: Your ads are not funny. They’re not clever. They certainly aren’t playful. Do the Internet a favor. Just stop.